The NEW Sense 57, designed by Berret-Racoupeau and Nauta Yachts, offers stunning comfort and remains loyal to the line’s basic concept. The deck plan is unique with cabins located to the bow so that the cockpit can be set lower. Sense revolutionises the very notion of travel, pushing the boundaries of sailing yachts. An architectural feat of navigation, she combines an innovative and unusual deck plan with a low on water hull. When elegance, comfort and power come together, you have the makings of an exceptional adventure. The Sense 57 is an ocean cruising yacht with an audacious concept. She is the pride of the range and everything about her spells adventure. 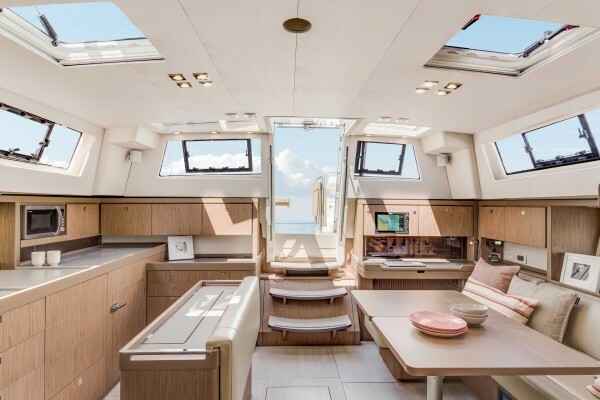 With all the cabins located in the bow, the deck plan of the Sense 57 is both clever and exceptional. As a result, the cockpit is closer to water level, which emphasizes her slender profile. The Sense 57 is perfectly balanced under sail and highly manoeuvrable. She is remarkably comfortable sailing in all sea conditions and she boasts fine cruising speeds. Getting-away takes on a whole new meaning. The Sense 57 has everything it takes to enjoy outdoor life at its very best. Incredibly spacious, the cockpit, sheltered by a semi-hard top, converts into a huge sunbathing area. A magnigicent aft swim platform lowers to sea level, offering you every opportunity to enjoy the water. To delight in every moment, the outdoor galley has a plancha-grill and a sink cleverly concealed below the helm seats.